Veteran music maestro Dr. Premasiri Khemadasa passed away at a private hospital yesterday evening. The internationally acclaimed musician and award winning composer was 71 years old at the time of his death. Having undergone a kidney transplant several years ago, Khemadasa Master returned to music direction and created music for several films, teledramas and the opera ‘Agni’ which toured the country. Dr. Khemadasa is the only known Sri Lankan musician who created opera and operatic music. Master was influential in introducing a unique music style to Sri Lankan cinema and he also pioneered the opera format to Sri Lankan music and performing arts. Born and bred in Talpitiya, Wadduwa, Khemadasa attended Sri Sumangala Vidyalaya and St. John’s College, Panadura. Dr. Khemadasa started his career as a flutist in Radio Ceylon and later took up music. Khemadasa’s debut as a film composer came with Sirisena Wimalaweera’s ‘Roddie Kella’ and collaborating with acclaimed director Lester James Peries. The music he directed for films like ‘Golu Hadawatha’ and ‘Nidhanaya’ were significant in the country’s film music scene. A self taught brilliant musician, explored various styles of music around the world and he combined Sinhala folk tunes, Hindustani music, Western music and many other streams of music in his compositions while adapting them to fit contemporary music. Dr. Khemadasa shared his music knowledge freely with a large number of young and talented pupils whom he had picked up mostly from rural areas and trained them to international standard. 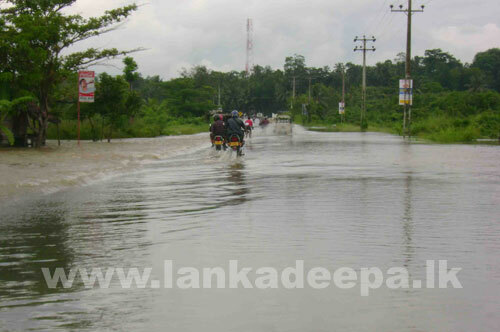 My electorate Bandaragama is one area the impact of yesterday’s heavy rain was felt worst. 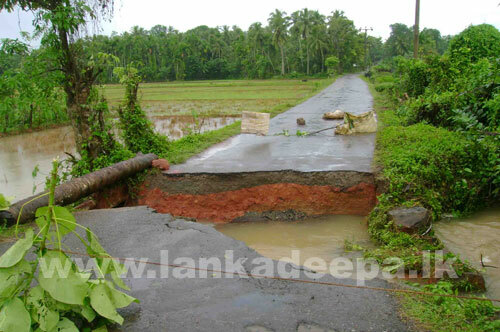 Many roads were under water and some like Bandaragama-Gonapola road (above) were physically damaged. At time when old Mother Hubbard has taken over the fortunes of Athletics, it is encouraging to see another contender dashing towards stardom. Now it is known that this eighteen-year old student from Gateway College, Shehan Ambepitiya who hails from a not so well to do family from Rajagiriya has already won three gold medals at the just concluded Junior Commonwealth Athletic Championships in “Pune’ India. A little known fact in his 10.43 100 metre effort in ‘Pune’ is that with this he has equalled the nine year old national record established by Chinthaka de Zoysa way back in 1999 at the Sugathadasa Stadium. 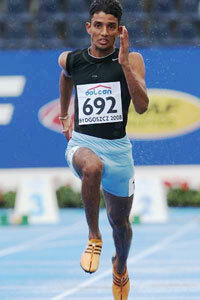 He won the ‘gold’ medals in the 100, 200 and the 4 x 100 metre events. Besides Shehan the only other medal winners at the meet were his 4 x 100 relay partners – Keith de Mel, Roshan Chamara Silva and Ranil Jayawardena. Besides the above there were twenty two others who took part at this event which included the more familiar names of Jithmi Jayawickrema (national tennis champion), Mayumi Rahim, Andrew Abeysinghe and Inoka Karunaratne (all in swimming). Ambepitiya whose father is a small time vendor does not possess the wherewithal to provide for his prodigy off-spring as he has another daughter who is ailing with a kidney problem. However, Munchee Biuscuts have come to the assistance of this advanced level student in his activities.